I get you. Who wants to be a morning person when it is so cozy to curl up under the covers. My toddler’s eyes pop wide open and I have a little hand pushing down across my cheek as he uses my face for leverage to help him climb up and out from under the covers. It’s barely 6 AM (sometimes barely 5 AM). 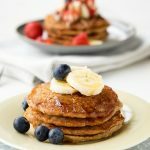 Before I open my eyes, I know I need a quick and simple breakfast recipe. So here’s my tip on how to try to be a morning person – make your breakfast the night before. And if I can barely keep my eyelids open the night before, then my go-to recipe is Overnight Chia Seeds in Yogurt. Mornings on a weekday can be like running through the airport terminal to get to our gate before the plane takes off. Are we going to all get out of the house on time? 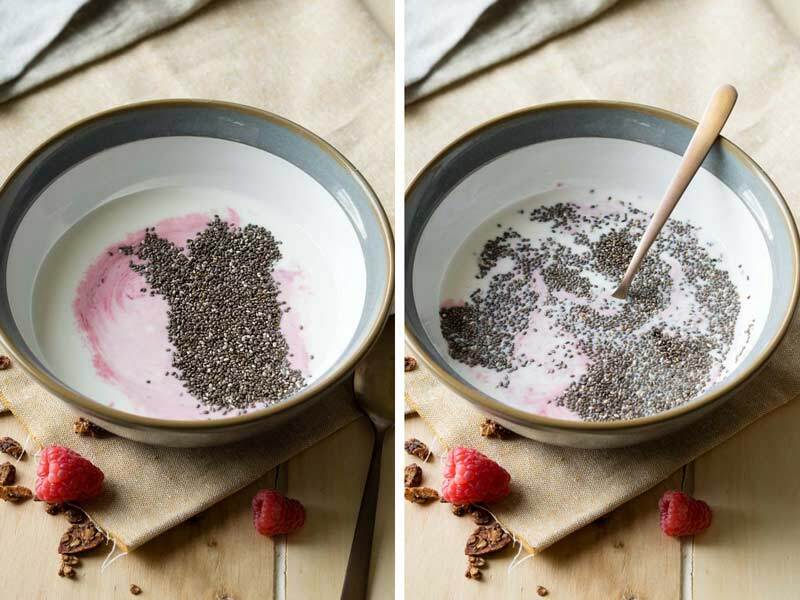 This pot of Overnight Chia Seeds in Yogurt comes to the rescue every time, without fail. 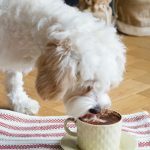 You may have noticed that I’m love chia seed puddings. I like to soak chia seeds in almond milk. I like to soak chia seeds in coconut milk. 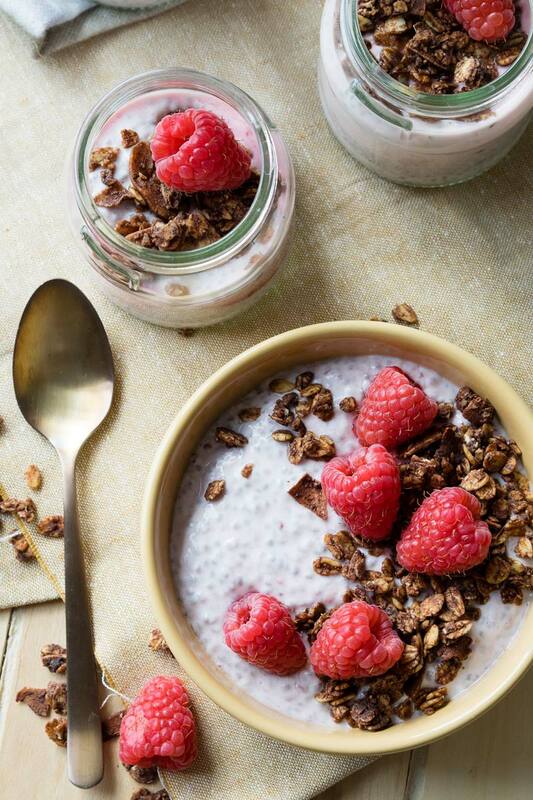 But for the creamiest chia pudding (and dreamy), you need to soak chia seeds in yogurt. 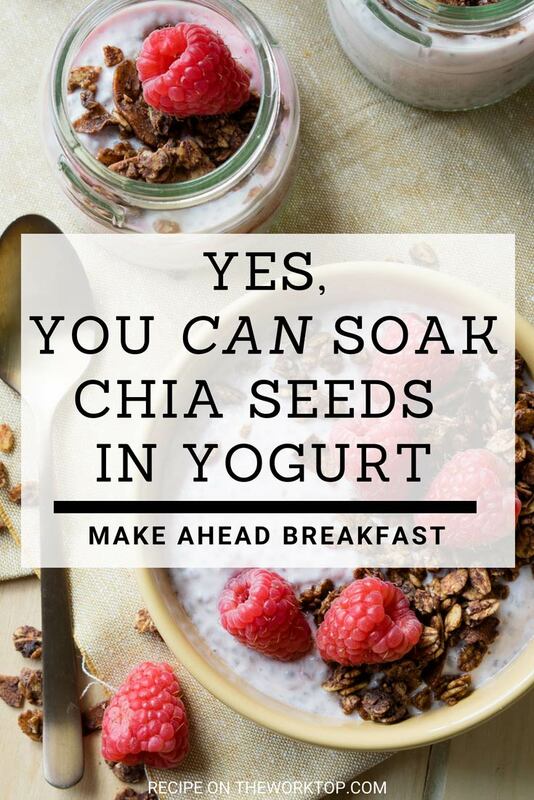 So in case you were wondering, yes yes, you can soak chia seeds in yogurt. And here’s the recipe to so you can make this easy breakfast at home too. The refrigerator puts in all the hard work to make this healthy make ahead breakfast. All you have to do is put yogurt, milk and chia seeds in a bowl, give it a stir, and place it in the refrigerator. As you get your sleep, the chia seeds do their magic and transform into a nourishing breakfast. You heard that right. This breakfast literally prepares itself while you are sleeping! 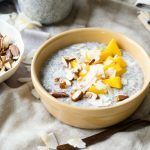 In the morning, you just need to give the chia seeds a quick stir, split the chia seed pudding into serving bowls, and top with your favorite granola and/or fruit. 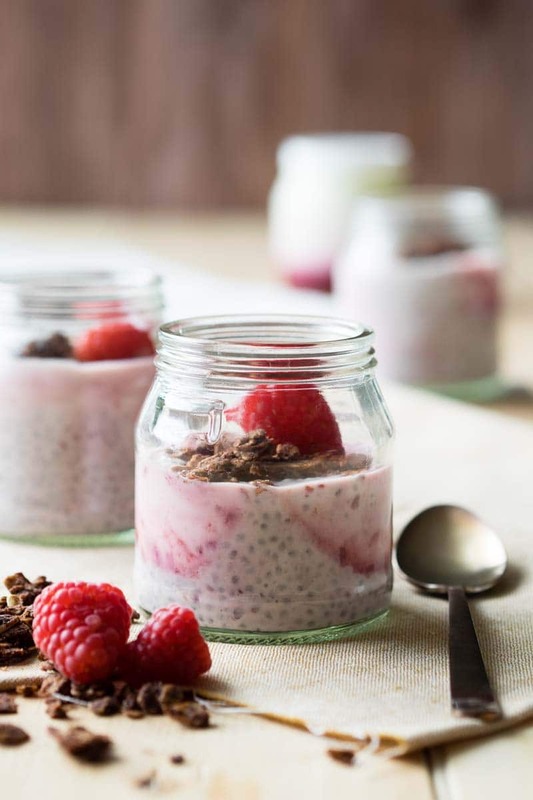 We love using Glenilen Farm Raspberry Yoghurt to make these Overnight Chia Seeds in Yogurt. The yogurt has just the right amount of tang, and contains the perfect serving of raspberry fruit on the bottom. 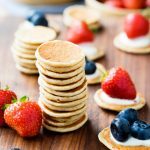 They are made with less sugar than many other brands of yogurts, so they are a perfect a healthy breakfast for our family. 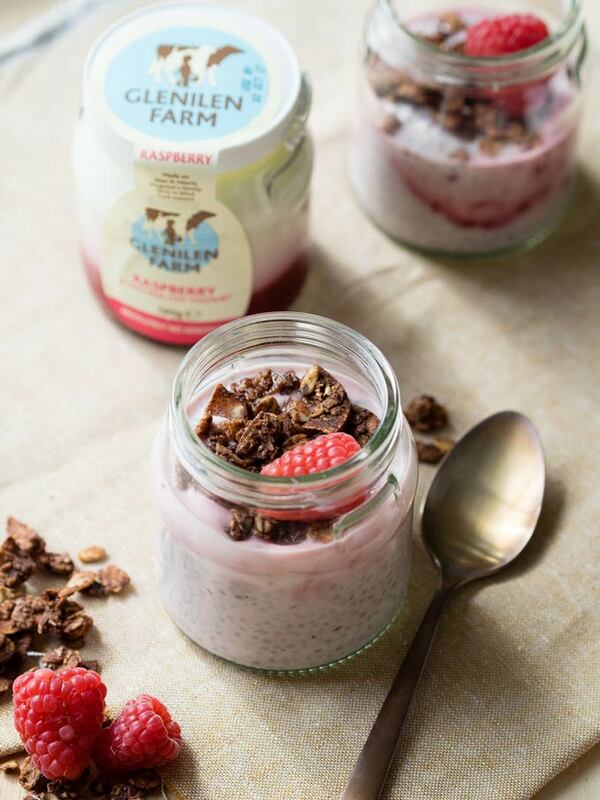 These little jars of Overnight Chia Seeds in Yogurt are served in Glenilen Farm Yoghurt pots. You can buy the yoghurts in 500g containers and 160g individual serving pots. We save the individual serving pots to serve the chia pudding in. The tops of these pots also cap back on, making these pots of Overnight Chia Seeds in Yogurt easy for a grab and go breakfast. 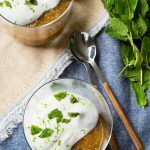 What toppings to use for your chia seed pudding? There are a million different toppings that would work well with this chia seed pudding. But you’ll see my favorite combination in the photos. My favorite way is to use a raspberry yogurt and a chocolate granola. I like the sweetness and tang of the raspberry yogurt paired with chocolate. 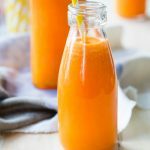 This is such a simple recipe that I hope it makes it way to your breakfast table over and over again. 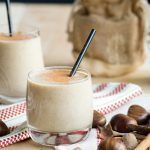 It’s healthy and nourishing, and it will give you a good start to the day. Not only do you get the health benefits of the chia seeds, you also get the protein and calcium from the yogurt. 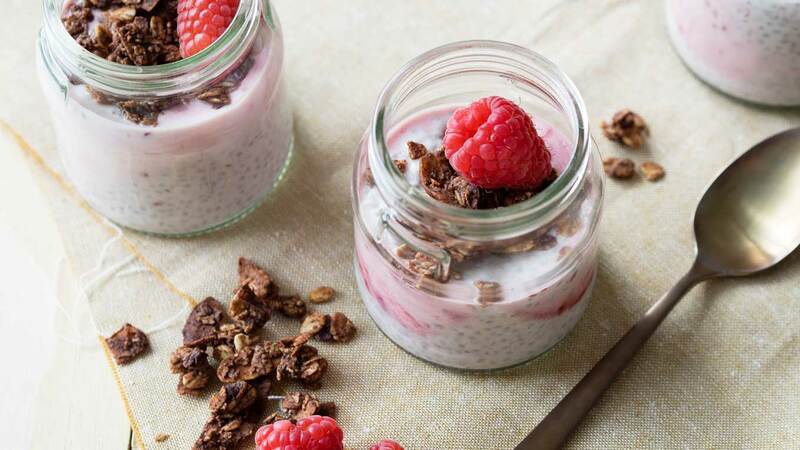 Enjoy this recipe for Overnight Chia Seeds in Yogurt! 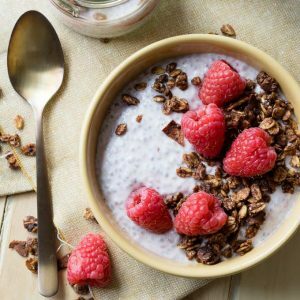 Overnight Chia Seeds in Yogurt makes a healthy and delicious breakfast. If you can keep your eyes open for an extra 30 seconds before bed, put yogurt, milk and chia seeds in a bowl, give it a stir, and place it in the refrigerator. As you get your sleep, the chia seeds do their magic and transform into a nourishing breakfast. In a medium bowl, mix together the yogurt and milk. Stir in the chia seeds. Cover and set in the refrigerator overnight. If you can, stir the chia seed mixture a couple times after putting it in the refrigerator (after 30 minutes, after 1 hour). It is not necessary (ie. if you go to sleep), but it will help prevent clumps. In the morning, give the chia seed pudding a good mix, breaking apart any clumps. Stir in another spoonful or two of yogurt, if desired. Spoon into two bowls, or into reserved yogurt containers. Top with your favorite chocolate granola and a few fresh raspberries. 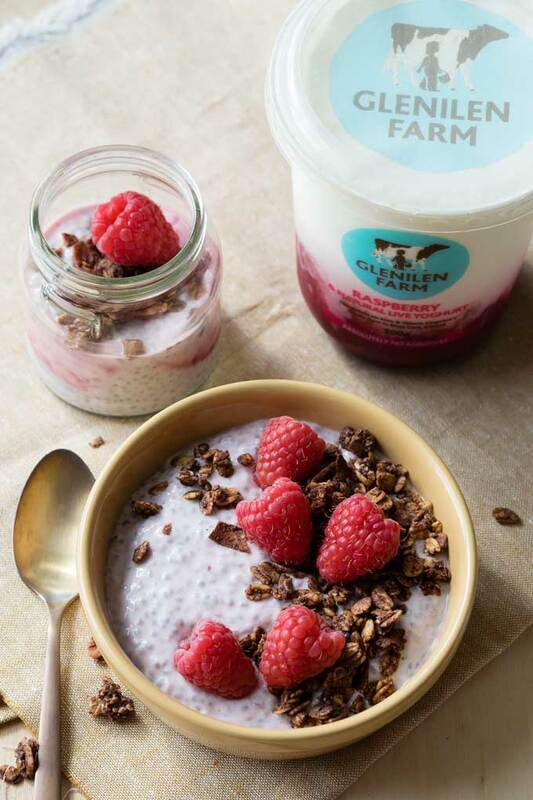 If you use an individual pot of Glenilen Farm Raspberry Yoghurt, you will use the entire pot. To save time on measuring the milk, you can use the empty glass container. The amount of milk will be just about one full jar of milk. Want more chia seed recipes? Give these recipes a try! This looks wonderful!! 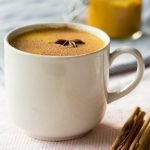 Has anyone tried using almond milk rather than whole milk? Hi Kari, I make chia seed pudding with almond milk all the time and it’s great! You should have no problem using it in this recipe. Enjoy! 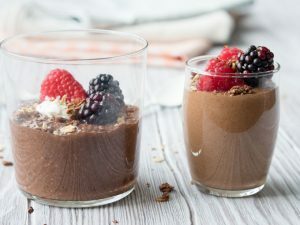 When doing this recipe, how long does the Chia yogurt mixture last in the fridge? Can I make a large batch that can last three days in advance? Hi Jen, I usually don’t make it more than 2 days out, but I’m sure others have made it longer in advance. It probably goes without saying, but you’ll want to make sure the yogurt and the milk haven’t spoiled. Make sure you use clean containers, utensils, and keep the chia pudding well covered and stored. These look DELIGHTFUL! I don’t think I’d be able to sleep in knowing these yogurt pots were in the fridge, I’d be too excited! Ha! 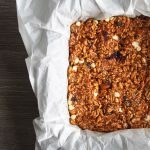 That defeats the purpose of the recipe ;) It’s supposed to allow you to sleep in just a bit more since breakfast will be ready in the morning! Well, it’s in the fridge so you can serve yourself breakfast. My goodness these are so pretty!!! 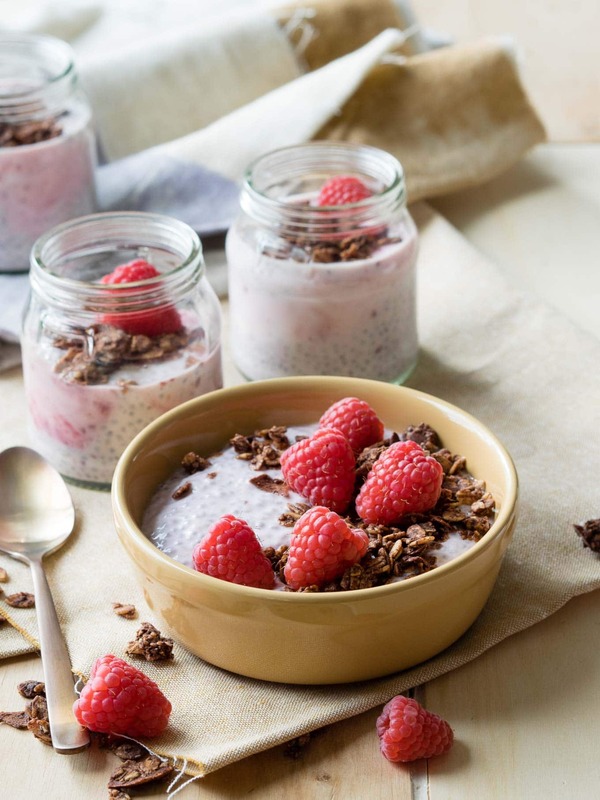 I would happily enjoy a bowl of these overnight chia seed yogurts in the morning … or for a snack. Yum! Thanks, Emily! Chia pudding does make a really healthy snack too. I need to do that more often here, instead of snacking on something unhealthy. Enjoy the recipe! Just made this recipe and it’s in the fridge!!! I used vanilla soy milk, instead of whole milk. Can’t wait to try it tomorrow! Can you add frozen fruit? Good idea! I haven’t tried it before, but sounds like a time saver for the mornings. Wish I could send a jar of this chia seed pudding over your way!